Reston’s Used Book Shop on historic Lake Anne Plaza was celebrating their 35th anniversary, so my friend and I went to check it out. We met outside the shop at the well-known statue of Robert E. Simon (the founder of the community of Reston). Upon entering the modest sized shop you feel at home with the area rugs, comfortable seating and the packed, yet organized old bookshelves stretched to the ceiling. All the books on this special day were discounted 35 percent in honor of the anniversary. 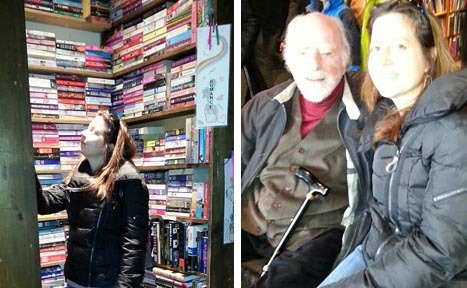 The store quickly filled with literature fans and patrons new and old. Before leaving, I noticed a familiar looking older gentleman sitting on a couch. Turns out it was Robert E. Simon himself! He graciously chatted away with me, obliged having his photo taken (but in true old school gentleman style took off his signature cap first) and invited my friend and I to return in April for his 99th birthday celebration.